The Disneyland fireworks have long been part of the magical experience that is Disneyland. In 1958, Walt Disney asked that a fireworks show be developed against the backdrop of Sleeping Beauty Castle, just like it was depicted on the TV show. In fact, when the show was launched, a person dressed up like Tinkerbell appeared to fly over the crowd on a zip line. The fireworks show was a way to give people something to look forward to later in the evening and became a popular fixture, changing only in content and the growing creativity of the fireworks displays. The first fireworks show was "Remember...Dreams Come True." 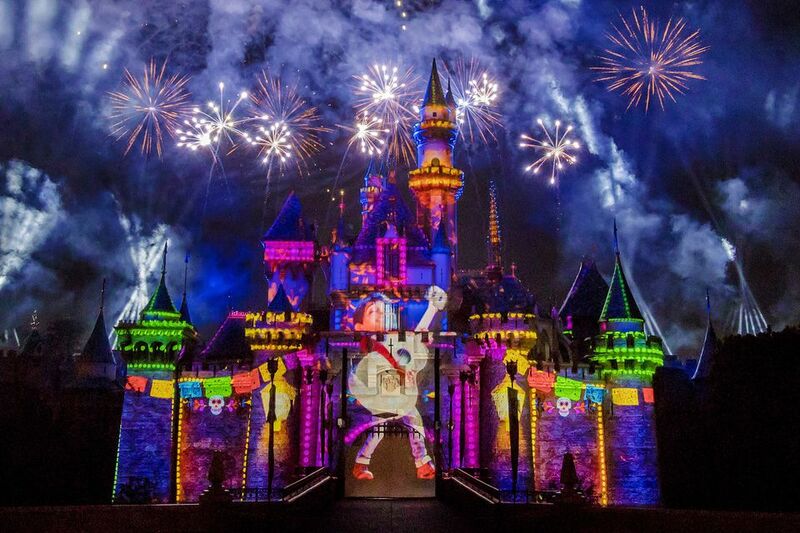 This nostalgic program was resurrected for the Disneyland 60th Anniversary and is still shown on scheduled evenings, taking a break for new fireworks shows. While Tinkerbell still is a prominent feature in the show, she no longer flies over the crowd. For many holidays, including Fourth of July, Christmas and New Year's Eve, a seasonally themed fireworks display replaces "Remember." And, just for folks who come to Mickey's Halloween Party, there's a special Halloween version, too. The evening fireworks shows are an elaborate performance of music, lights, and dazzling special effects. The shows are worth remaining in the park to see or, if you are staying at a hotel nearby, returning to the park in time for the show. Fireworks go off over the castle. The closer to the castle, the better, unless you are concerned about the noise which scares some children and people sensitive to loud noises. These are a few of the best places to position yourself to watch the Disneyland fireworks. The best place to see the fireworks is right next to the rope in front of the castle, where it feels like the show is just for you. The "safety line" (closest you can be during the show) will be set up by Disney staff and varies from evening to evening. Stake out your spot too early and too close and you may have to move. As you find a spot to wait, ask a cast member if you'll be able to stay there during the show. The hub is also a great place for fireworks viewing. By "the hub," Disneylanders mean the area between the end of the Main Street buildings and the castle. Views will be good, but buildings and trees can get in your way. If you can see the castle and the Matterhorn, you'll have an unobstructed view. If you're tired and hungry around fireworks time, snag a table at the Jolly Holiday Bakery. Sit near the outer railing in a spot with a good view, then send your companions to pick up something to eat while you hold the seats. Another good spot at the hub is directly behind the statue of Walt and Mickey. The area fills up a little later than other spots (probably because people wrongly assume that the statue will block their view), but it actually offers a great view without obstructions because the fireworks go off high enough that the statue doesn't get in the way. Some prefer seeing the show from a distance. It's beautiful to see the "big picture" and the sounds of the fireworks are not as intense. You can stand anywhere along Main Street that Cast Members allow. You'll be close to the exit if you're leaving the park afterward, but your view will be a little restricted by the buildings. If you want to see more of the fireworks, just be sure you can see the castle clearly. At the Main Street Railroad Station, the elevation gives a nice overview of the show and it's close to the exit so you can leave as soon as the show ends. A less-crowded place to watch the fireworks is along the corridor that leads toward Toontown, just past "it's a small world." From there, you can get back into Fantasyland as soon as it re-opens. See the show on high from the balcony of the Tomorrowland Expo Center. Go inside and up to the exit or bravely march directly up the exit ramp, then stand close to the triangular pylon. You won't be able to see everything, but it's uncrowded and you can get onto the Monorail as soon as it starts running after the show and zip right out to Downtown Disney. The fireworks shows are so impressive that they can be viewed from outside the park. Relax at one of the on-site hotels or enjoy the show while dining. Some rooms at the Disney-owned hotels have great views of the fireworks, especially the Disneyland Hotel's Adventure Tower and some rooms at the Grand Californian. And their televisions have a channel the plays the music. You can even watch from California Adventure. One of the best places to watch the Disneyland fireworks is from the Carthay Circle Restaurant in California Adventure. Make your reservation early and request seating on the outdoor patio where you have a view. They even pipe in the music. In general, the fireworks shows begin around 9:30 p.m. The show times vary, but on average, they last about 20 minutes. Consult the schedule for days and times. For visitor safety, Fantasyland and Toontown close during the fireworks and the monorail stops running. Toontown will stay closed afterward, but Fantasyland may open again. Disney's fireworks permit allows for 200-plus shows per year. Fireworks happen on weekends only during less-busy times. If you don't like loud noises, the Mickey and Friends parking garage roof is far enough away that you won't hear the ka-booms, but you can still see the show. Take the Mickey and Friends tram from Downtown Disney, leaving at least 30 minutes before starting time. Take the escalator to the top level of the garage and watch from there. On a moderately busy day, choose your viewing spot least 30 minutes before the fireworks start. Make that an hour ahead of time if you want to be just in front of the castle. You can watch from anywhere you can park your wheelchair or ECV (mobility scooter), but try to find a spot where no one can stand in front of you. Disney also sets aside a few roped-off areas for wheelchairs and ECVs. If you choose to use one of them, try to park in the center of the area. Crowds can get a bit pushy.